Contender comparisons: Now that we finally know who's been Oscar nominated, the next question is -- Who's going to win? With nine films competing for best picture, there's no shortage of reasons for deciding how any one of them might edge out the others. After all, Oscar voting is driven by multiple forces and emotions – including, the number of noms (reflecting overall popularity with Academy branches), diversity, filmmakers' Oscar pedigree (past wins), boxoffice success, other major awards received, Academy film genre preferences, critics approval, filmmaker and stars likeability and how comfortable Academy members are telling the world that this is the film that's worthy of being acclaimed as the year's best picture. To zero in on how the best picture race could wind up, here's a quick (alphabetical) look at nine contender comparisons, covering a wide range of key points that can lead to success or disappointment. FILM EDITING NOM: Joe Walker. Last Friday, Walker won the American Cinema Editors' (ACE) Eddie Award for best edited feature film-dramatic. Ten of the last 13 Eddie-dramatic film winners went on to won the film editing Oscar. Film editing is a key nom for any best picture contender because no film since 1980 has won best picture without having a film editing nom except for "Birdman" in 2014. PGA: Nominated, but did not win. SAG: Nominated for lead female actor (Adams), but did not win. BAFTA NOMS: 9 (including best film and director). DOMESTIC BOXOFFICE PRE-NOMS: $95.7 million (through 1/22). DOMESTIC BOXOFFICE POST-NOMS: $97.3 million (through 1/29). OSCAR PEDIGREE: Nothing previously for Villeneuve. His 2015 action crime drama "Sicario" received three Oscar noms (cinematography, original score, sound editing). NOTES: Not getting a widely expected best actress Oscar nod for Amy Adams, a five time Oscar nominee, puts "Arrival" at a disadvantage as it's the only best picture contender that's without support from Oscar's acting branch. On top of which, Adams just lost Sunday night in SAG's lead female actor race. It also doesn't help that it's a sci-fi storyline movie, a genre Academy members typically don't celebrate for best picture. It's helpful, however, that it does have both directing and film editing noms. ACTING NOMS: Best Actor (Denzel Washington). Supporting Actress (Viola Davis). SAG: Nominated for ensemble cast, but did not win. Nominated for lead male actor (Washington) and won. Nominated for supporting female actor (Davis) and won. GOLDEN GLOBES WINS: Supporting actress (Davis). BAFTA NOMS: 1 (Davis for supporting actress). DOMESTIC BOXOFFICE PRE-NOMS: $48.7 million (through 1/22). DOMESTIC BOXOFFICE POST-NOMS: $50.8 million (through 1/29). OSCAR PEDIGREE: Washington's received seven acting noms (including "Fences") with two wins (in 1990 for supporting actor for "Glory" and in 2002 for lead actor for "Training Day"). Davis has had three noms (including "Fences"), but no wins. NOTES: Washington and Davis both won at the SAG Awards and the actors branch, the Academy's largest voting group, often votes the way SAG does. 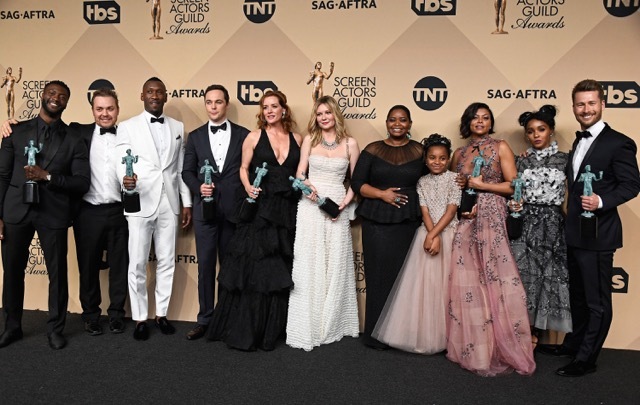 On the diversity driven front, "Moonlight" had the greatest early momentum, but with its twin SAG wins "Fences" is looking very good now -- and so is "Hidden" with its SAG ensemble cast victory. GENRE: World War II drama. FILM EDITING NOM: John Gilbert. ACTING NOMS: Best Actor (Andrew Garfield). SAG: Nominated for lead male actor (Garfield), but did not win. BAFTA NOMS: 5 (adapted screenplay, lead actor-Garfield, editing, makeup & hair, sound). DOMESTIC BOXOFFICE PRE-NOMS: $65.5 million (through 1/22). DOMESTIC BOXOFFICE POST-NOMS: $65.9 million (through 1/29). OSCAR PEDIGREE: Gibson won best picture and best directing in 1996 for "Braveheart." NOTES: If Academy voters want a best picture that's a traditional large scale action drama with a serious message, this is their only choice. It's got both directing and film editing noms, which helps. "Hacksaw's" World War II storyline recalls what's been called "America's Greatest Generation," a generation that includes the Academy's oldest voting members. GENRE: Modern western crime drama. FILM EDITING NOM: Jake Roberts. ACTING NOMS: Supporting Actor (Jeff Bridges). SAG: Nominated for male supporting actor (Bridges), but did not win. BAFTA NOMS: 3 (screenplay, supporting actor-Bridges, cinematography). DOMESTIC BOXOFFICE PRE-NOMS: $27 million (through 1/22). DOMESTIC BOXOFFICE POST-NOMS: $27 million (through 1/29). OSCAR PEDIGREE: Bridges has had seven noms (including "Hell") with one win (in 2010 for lead actor for "Crazy Heart"). NOTES: Westerns of any type have an uphill battle to fight any year in Oscar's best picture race. "Hell's" best Oscar shot is Bridges, a longtime Academy favorite whose biggest challenge is supporting actor favorite Mahershala Ali for "Moonlight," who won at the SAG Awards. ACTING NOMS: Supporting Actress (Octavia Spencer). SAG: Nominated for ensemble cast and won. Nominated for female supporting actor (Spencer), but did not win. BAFTA NOMS: 1 (adapted screenplay). DOMESTIC BOXOFFICE PRE-NOMS: $83.7 million (through 1/22). DOMESTIC BOXOFFICE POST-NOMS: $104 million (through 1/29). OSCAR PEDIGREE: Spencer's had two noms (including "Hidden") with one win (in 2012 for supporting actress for "The Help"). NOTES: It's usually not a good sign if a best picture nominee doesn't also have directing and film editing noms. But "Hidden's" best ensemble cast win at the SAG Awards is a major victory just as the Oscar race is heating up. Spencer, who lost in SAG's female supporting actor race, faces diversity driven Oscar supporting actress competition from Viola Davis ("Fences"), who won Sunday at SAG, and from Naomie Harris ("Moonlight"), who also did not win at SAG. FILM EDITING NOM: Tom Cross. Cross won the American Cinema Editors' (ACE) Eddie Award for best edited feature film-comedy. ACTING NOMS: Lead actor (Ryan Gosling), lead actress (Emma Stone). PGA: Nominated and won. For 19 of the past 27 years, the PGA winner has also won the best picture Oscar. Last year the PGA went for "The Big Short" while the Academy voted for "Spotlight." The eight year period before that saw a perfect match for "Birdman," "12 Years a Slave," "Argo," "The Artist," "The King’s Speech," "The Hurt Locker," "Slumdog Millionaire" and "No Country for Old Men." SAG: Nominated for male lead actor (Gosling) and did not win. Nominated for female lead actor (Stone) and won. 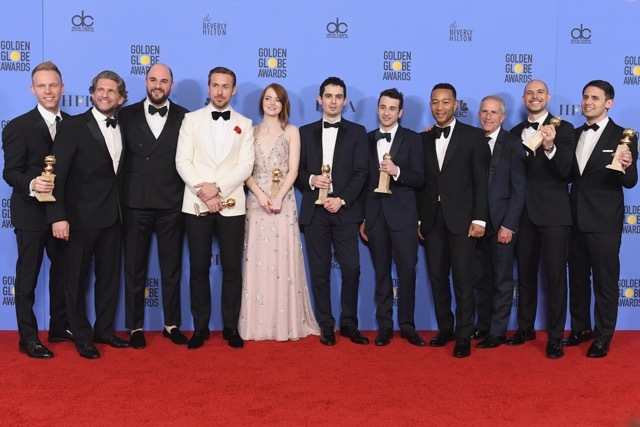 GOLDEN GLOBES WINS: 7 (including picture-musical or comedy, director, actor-musical or comedy-Gosling and actress- musical or comedy-Stone). BAFTA NOMS: 11 (including picture, director, lead actor and lead actress). DOMESTIC BOXOFFICE PRE-NOMS: $89.8 million (through 1/22). DOMESTIC BOXOFFICE POST-NOMS: $106.5 million (through 1/29). OSCAR PEDIGREE: Chazelle's had three noms (including two for "LLL" and one in 2015 for adapted screenplay for "Whiplash"). Gosling's had two noms (including "LLL" and in 2007 for lead actor in "Half Nelson"). Stone's had two noms (including "LLL" and in 2015 for supporting actress in "Birdman"). NOTES: With 14 noms under its belt, "LLL" is clearly the film to beat for best picture – unless Academy members refuse to go "light" and insist on voting, as they typically do, for a globally important serious drama with social relevance. The urge to celebrate diversity will also be especially strong this year and that won't help "LLL." ACTING NOMS: Supporting actor (Dev Patel), supporting actress (Nicole Kidman). SAG: Nominated for male supporting actor (Patel) and female supporting actor (Kidman), but did not win in either race. BAFTA NOMS: 5 (including supporting actor-Patel and supporting actress-Kidman). DOMESTIC BOXOFFICE PRE-NOMS: $16.3 million (through 1/22). DOMESTIC BOXOFFICE POST-NOMS: $19.8 million (through 1/29). OSCAR PEDIGREE: Kidman's had four noms (including "Lion") with one win (in 2003 for lead actress for "The Hours"). NOTES: It's usually not a good sign if a best picture nominee doesn't also have directing and film noms. It doesn't help that "Lion's" competition includes three other strong diversity driven titles ("Fences," "Hidden Figures" and "Moonlight"). ACTING NOMS: Lead actor (Casey Affleck), supporting actor (Lucas Hedges) and supporting actress (Michelle Williams). SAG: Nominated but did not win for male lead actor (Affleck), female supporting actor (Williams) and ensemble cast. GOLDEN GLOBES WINS: 1 (Affleck for best actor-drama). BAFTA NOMS: 6 (including picture, director, actor-Affleck and supporting actress-Williams). DOMESTIC BOXOFFICE PRE-NOMS: $38.9 million (through 1/22). DOMESTIC BOXOFFICE POST-NOMS: $41.5 million (through 1/29). OSCAR PEDIGREE: Williams has had two supporting actress noms (including "Manchester") and two lead actress noms. NOTES: This is a tough year to be a best picture nominee without diversity credentials. Affleck had looked like "Manchester's" best awards shot, so his SAG loss is a big set-back. FILM EDITING NOM: Nat Sanders and Joi McMillon. 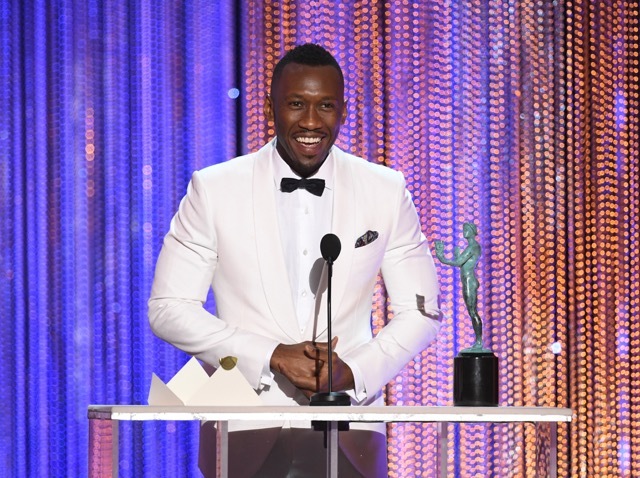 ACTING NOMS: Supporting actor (Mahershala Ali) and supporting actress (Naomie Harris). SAG: Nominated for male supporting actor (Ali) and won. Nominated but did not win for female supporting actor (Harris) and ensemble cast. GOLDEN GLOBES WINS: 1 (best picture-drama). BAFTA NOMS: 4 (including picture, supporting actor-Ali and supporting actress-Harris). DOMESTIC BOXOFFICE PRE-NOMS: $15.8 million (through 1/22). DOMESTIC BOXOFFICE POST-NOMS: $17.8 million (through 1/29). NOTES: Small independent films without big stars or well known directors don't usually win best picture. But in a diversity driven year like this one, a highly acclaimed serious and socially relevant drama like "Moonlight" could have an unusual advantage. (1) DIVERSITY DRIVEN: "Fences," "Hidden," "Lion," "Moonlight"
(2) OSCAR NOMS FOR BOTH DIRECTING & FILM EDITING: "Arrival," "Hacksaw," "LLL," "Moonlight"
(3) OSCAR NOMS FOR DIRECTING & FILM EDITING PLUS A DGA NOM: "Arrival," "LLL," "Moonlight"
(4) OSCAR ACTING NOMS: "Fences," "Hacksaw," "Hell," "Hidden," "LLL," "Lion," "Manchester," "Moonlight"
(5) GENRE – SERIOUS DRAMA: "Fences," "Hacksaw," "Hidden," "Lion," "Manchester," "Moonlight"
If we add up the number of advantages listed above for each film, scoring one point per mention, the totals are: "Moonlight" (6), "Hacksaw" (4), "LLL" (4), "Lion" (4), "Arrival" (3), "Fences" (3), "Hidden" (3), "Manchester" (3) and "Hell" (1). And the Oscar goes to? Based on love from Academy branches, it's "LLL" with 14 noms. However, "Moonlight" has a solid lead when it comes to key advantages, but it's a very small film without big stars. "Hidden" won SAG's equivalent of best picture and that's very helpful since actors make up the Academy's largest voting branch. But "Fences" also did very well at SAG, taking home both of the guild's lead actor awards. Plus, "Fences" and "Hidden" both have big stars, which could give them an edge over "Moonlight" when it comes to winning Academy members' votes. So don't place your bets just yet. The race just got hotter and final Oscar balloting doesn't even start until Feb. 13.